Only a small number of these early, Vintage Baseline issues remain. This set includes Issue 17, published in 1994 up to issue 31, published in 2000. This set includes the first issue of Baseline designed by HDR, Baseline 17 in 1994. The selected contents shows ‘new’, up-coming work by designers such as P Scott Makela and David Carson, Emily Obermann (Amerika), Russell Warren-Fisher (England), or Cyan and Grappa (Berlin). It also carries a 6pp fold out feature, about the ‘History of type design through the influence of tools’ – from Cuneiform to DTP. The article is printed with a special PMS grey ink. A collectors treat is the specially designed and bound in Baseline subscription card. Baseline 17 was the first of only 3 issues (issues 17-19) with this little novelty stapled in. Check out the various silly marketing applications of Harry Beck’s London tube map in Baseline 21 or the unique arabic calligraphic creations by Ahmed Moustafa. Moving on to Baseline 23: FUTURA, one of the most prominent, modern 20th century typefaces. Academic Chris Burke of Reading University debates the ‘Authorship of Futura’ and shows it’s rare patterns for matrix production at the Bauer typefoundry in 1925. Also shown in the issue, powerful and striking book cover designs and typography by Talwin Morris, a friend of Charles Rennie Mackintosh. Baseline 26 has the first wrap around jacket/poster! This issue is especially rare and iconic. Articles include British commercial artist Abram Games and German corporate identity designer Otl Aicher, as well as Arabic type and digital blackletter. Baseline 29 features two graphic titans from London, Alan Fletcher and Alan Kitching. Alan Fletcher’s cardboard symbol messages were a passion of his and he shared a collection of them exclusively with Baseline. Alan Kitching is the ‘Typographic Timelord’. His letterpress illustrations are second to none and he designed the wrap around poster for this issue! 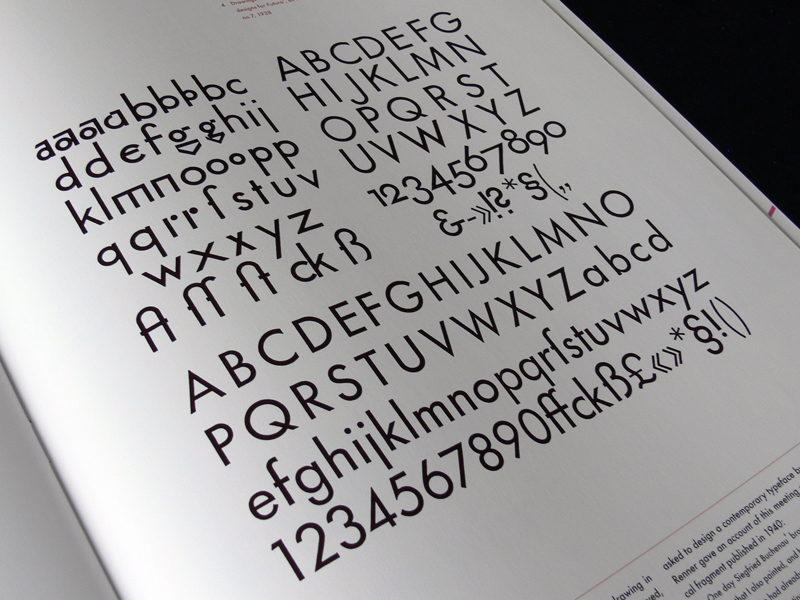 Baseline 31 includes the revolutionary photography and typography of Alexey Brodovitch. The article is analytical written by Kerry William Purcell. Brodovitch masterworks which remain classical and have the ability to astonish now, as much as when they were first created. The above information is just a fraction of the informative, fascinating, inspiring and unique contents of this whole collection of 15 issues of Baseline. Numerous issues have won awards from the ADC, TDC, German Design Prize, Tokyo TDC, D&AD, Society of Typographic Designers, Brno Design Biennale, etc. The typography of every single article is carefully crafted and individual for each and every contribution, depending on its content. The production includes special printing processes and colours, such as metallic or fluorescent inks and various quality paper stock ranging from specially coated to uncoated craft material. These early copies of Baseline are on very low stock. If you are intrigued… now is the time to get hold of these issues. 10 sets of 15 issues available with a 50% discount. Limited availability!